The delicate tangle Beadlines comes from Saskatoon-based artist and CZT® Margaret Bremner. This was the perfect tangle pattern for practicing the upright pen position and light drawing touch lesson I learned recently about the Microns from Sakura. Beadlines is such a simple, elegant pattern with its wavy lines and regularly spaced triplets of beads and it has a nice sense of motion to it. A very handy tangle to have in your repertoire with lots of potential options. You can vary the number, spacing, and shape of the beads as well as the type of line you use. 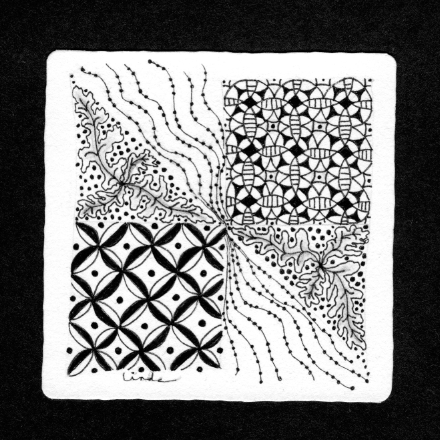 Margaret doesn’t give instructions for Beadlines, but the pattern first appears here in a 6-inch square (15 cm) Zentangle-inspired piece of collage art named Twitterpated she is currently exhibiting. Today I thought I’d share one of my own Zentangles. I started this one with 4 squares as my string and was playing with OoF and Bales in opposite corners. Then I thought it needed something organic to balance those two so I added Sampson. All three official tangle patterns. Then it sat for a week or two as I waited for it to tell me what needed to go in the last remaining white spaces. While working on this post, I picked up my little stack of Zentangles waiting to be finished and knew immediately that Beadlines wanted to go there. So far I don’t give my Zentangles names because I enjoy going back to them, turning them around in all directions and getting fresh new impressions that aren’t influenced by a title. (Untitled) Zentangle® by Linda Farmer, © 2011 All Rights Reserved. Great tangle that one and I love your tile.